Search for and open "Power options" in the Start Menu. Click "Choose what the power buttons do" on the left side of the window. Click "Change settings that are currently unavailable." 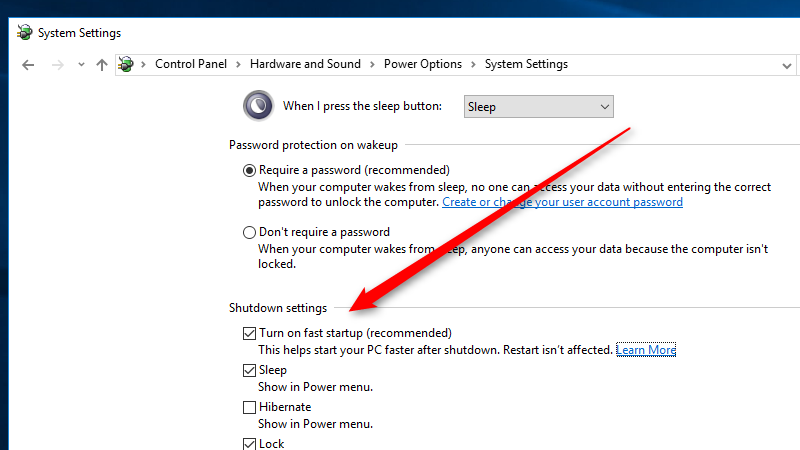 Under "Shutdown settings" make sure "Turn on fast startup" is enabled. On a clean install, this setting should be enabled by default, however if you're upgrading from a previous install with tweaked power settings, it might not be. When I checked my own machine, this feature was not enabled. Either way, once it's turned on, you should notice considerably faster boot times. Enabling this can cause problems too. Essentially it's not a true shutdown, in the sense that it's more a suspended state that is restored. So any conflicts or bugs may reappear. And the standard fix-all (i.e. a Restart) may not work as intended. I experienced this around failed recognition/driver loading for a WWAN card. For whatever reason, it operates via USB rather than PCI. And variously, either just the card or all USB3 ports wouldn't work. Powering off and back on again wouldn't resolve the issue. Hence hassle uninstalling and reinstalling device drivers. But switching this setting off did the trick. On start-up all devices are reinitialised and if the conflict (as above) occurs, a restart is all that's necessary again. Interestingly, from a speed perspective, I've recorded no more than a couple of seconds difference in boot up time with or without this setting enabled. Admittedly, this is on a i7, 16GB, SSD laptop but it's by no means flagship and is a couple of years old now. In this case, why wouldn't the restart option do the job? As far as I'm aware, shutting down will do the hibernation, but restarting will not, so restarting should clear up issues that shutting down and booting up again would not. Confusing as all hell, sure. Because this is basically hibernate to disk be aware that any encryption keys and passwords you have entered and that were still in memory will be written to disk, all nice and handy for anyone to grab later, even months in the future if they do a little disk unerasing. Also be aware that if you dual boot Linux that this makes the Windows drive unreadable. You need to shut down cleanly to read the drive safely from Linux. I always recommend fastboot is off on any pc. It causes to many issues when something else goes wrong.